Clients are always appreciative of the service at the Hotel San Miguel, where the staff members are particularly helpful and welcoming. 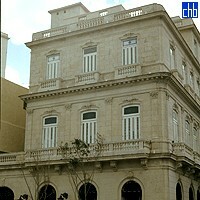 This grand nineteenth century mansion was restored and is now run by the Office of the City Historian of Havana, so all its profits are reinvested in the restoration of the city’s historical centre. The establishment is named after Antonio San Miguel y Segalá, an important member of Havana society who acquired it in 1913. 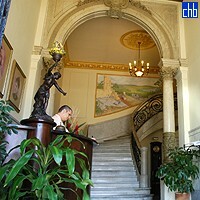 Its interiors combine grandeur with intimacy, sometimes to slightly eccentric effect, as in the sweeping marble stair which seems to have ideas above its station, shoehorned as it is into a rather small hallway. The rooms at the San Miguel are very comfortable, though, and from the roof terrace there’s a wonderful view of the entrance to the harbour and the lighthouse of the Castillo de los Tres Santos Reyes Magos del Morro. 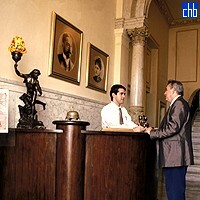 The San Miguel is excellently placed for exploration of Old Havana. 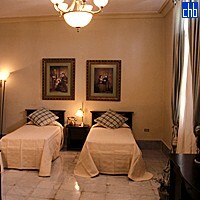 The 10 standard rooms at the San Miguel come in a variety of shapes and sizes, but they are all very agreeable. Those on the first floor overlooking the port are really beautiful, with high ceilings and towering French windows opening to small balconies from which one can gaze at the eighteenth century fortifications and the ships entering the harbour. The colour scheme is vanilla and raspberry, many of the furnishings are antique, the bedroom floors and bathrooms are tiled with pale grey marble and most of the French windows are crowned with traditional decorative stained glass. 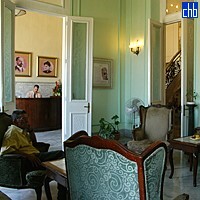 Furniture is a mixture of modern and colonial styles and the walls are hung with daguerrotypes of members of high Havana society: simpering belles in swathes of satin; their fierce mothers in black bombazine, young bucks with flashing eyes and bristling moustaches and startled-looking babies in froths of lace. 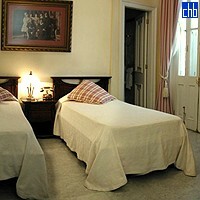 Only one of the rooms has matrimonial bed. The other 9 are twin bedded.